For the second time in the season James Hunt won a race only to be disqualified in the aftermath. Unlike the Spanish Grand Prix, however, there was no happy ending as Hunt was stripped of his win at the British Grand Prix more than two months later after an appeal against the result by Ferrari. Buoyed by his win in France, there was huge local media interest in Hunt in the build-up to the race, and expectations were high even though championship leader Niki Lauda was on pole. Also vying for attention were two female entrants - Divina Galica in a Surtees and Lella Lombardi in a Brabham - although neither made it through qualifying. 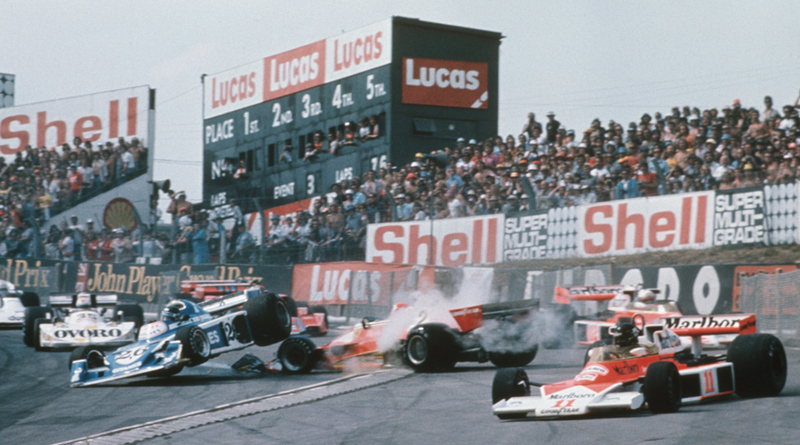 The race was only seconds old when it was halted by a crash at the first bend which took out a number of cars. Hunt made a poor start and going into Paddock Hill Bend, Clay Regazzoni tried to cut inside his Ferrari team-mate and rear-ended him, causing chaos. Hunt was also hit from behind as he tried to avoid the spinning Ferraris - "Clay put Niki on the dirt and then someone hit me up the backside" - and his McLaren was sent airborne before landing with a thump. He managed to limp round the track and into the pits. As those not involved completed the lap, the stewards brought out the red flags. Then the wrangling started. As the grid was reassembled, the stewards announced no spare cars would be allowed at the re-start, nor would anyone who had not completed the first lap be eligible. Several cars which had finished the lap in the pit lane were thus excluded. Hunt, because he was in the pits, and Regazzoni and Jacques Lafitte because their cars were irreparably damaged. An announcement to this effect was greeted by boos from the 77,000-strong crowd, and then beer cans started cascading onto the track. McLaren further fueled the unrest by wheeling Hunt onto the grid to rapturous applause. Faced with unpalatable alternatives, officials decided to allow everyone to re-start in a bid to avoid further angry scenes. On the re-start, Lauda again made the best getaway but this time Hunt was right with him with Regazzoni in third. It stayed that way for 45 laps, the gap between Lauda and Hunt never more than four seconds, but then the Ferrari started suffering from gear problems and Hunt was able to pass and thereafter he slowly increased his lead. Regazzoni's race ended earlier with failing oil pressure, allowing Jody Scheckter to take third in his six-wheel Tyrrell. Yet again the drivers' celebrations had hardly started when the stewards summoned them. The Ferrari, Tyrrell, Brabham and Copersucar teams all lodged a protest against Hunt who, they claimed, should not have been allowed to re-start. All but Ferrari were persuaded to withdraw their objections and, after three hours, the stewards decided the result would stand. "It's disgusting that Ferrari protested after their cars caused the accident which would have put me out of the race and certainly damaged my car," Hunt said. "Perhaps we should all get together and sort out a rule book everyone understands." But the matter was not over. Ferrari appealed, and a fortnight later that was rejected by the Royal Automobile Club, the race organisers. In a fit of pique, Enzo Ferrari announced the team would withdraw from the championship. The threat was not carried through, although the team did appeal to the FIA, and on September 24 it ruled against Hunt and he was disqualified. By that time Lauda had had his life-threatening accident and the season had turned on its head.